How to Send & Receive Text Messages on Mac – iMobie Inc.
How to send text messages on Mac? How to Receive text messages on Mac? Read this guide to know the answers. Have a try on AnyTrans to transfer text messages from iPhone to iPhone with ease after reading this post on how to send & receive text messages on Mac. 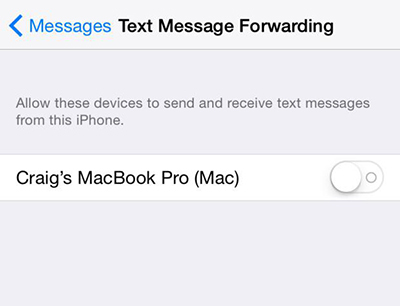 With an iPhone running iOS 8 and a Mac running OS X Yosemite, you can easily send & receive text messages on your Mac. The Handoff feature allows you to send or respond a message from your iMac or MacBook. So when your iPhone is not around you, you will not miss any important messages when you are working on your Mac. All the messages including iMessage and SMS messgaes on your iPhone now can also appear on your Mac. 1. Make sure your iPhone is running iOS 8.1 or later and your Mac is running OS X Yosemite. 2. Make sure both devices are logged into the same iCloud account. Step 1. 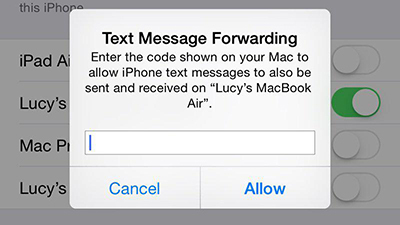 Enable Text Forwarding: On your iPhone go to Settings > Messages > Turn on "Text Message Forwarding" option. Step 2. Select the option opens a window with a list of your iOS and OS X devices. Toggle your Mac on. Step 3. You will receive a verification code to your Mac. Simply enter the code on your phone. That's it! If you want to transfer text messages from any iPhone to any Mac, you can use AnyTrans to make it. If you still have any question on this guide, please leave a comment in the comment section.